What exactly is gourmet beef stroganoff? Many folks remember this dish from childhood, but is anyone sure about its true origins? Below you'll find out more about this interesting recipe and how to make it yourself, gourmet-style! Beef stroganoff (also known as Беф-Строганов, or Bef-Stróganov, in Russian) first appeared in the 1891 Russian cookbook by Elena Molokhovets. Molokhovets' recipe for "Beef Stroganov with Mustard" included lightly breading cubes of beef before sautéing them and covering them with a sauce made from mustard and sour cream. Later recipes evolved to include ingredients such as onions, mushrooms, tomatoes, rice, noodles and potatoes. After imperial rule ended in Russia, the dish began to appear in hotels and restaurants throughout Asia. Soon after World War II, it became popular in the United States as Russian immigrants and American servicemen brought variations to North America. Beef stroganoff was a popular dish in the 1950s, which brought about further Americanized recipes and several pre-packaged versions from companies such as Kraft. What about the name stroganoff? No one is really sure where it comes from, but some believe that the dish was named after the Russian Stroganov family, from which many powerful celebrities and politicians were born. There are many possible variations when it comes to making beef stroganoff. Traditional recipes didn't contain all of the extra ingredients that have been added over the years, so the style of beef stroganoff Americans have come to know and love is an entirely different dish from how it appeared in the 1800s. A few things hold true, though - most people will not consider stroganoff true to form unless the beef has been dredged in flour and sautéed, then covered in a sour cream-based sauce. Some prefer their stroganoff over rice. For vegetarians, you can substitute large slices of seitan, tempeh or portobello mushroom for the beef, coating them lightly in flour before sautéing them. Vegans can make the dish using plain soy yogurt or a vegan version of sour cream. If you want to know more about gourmet beef stroganoff, there is a lot of information available on the Internet. Food bloggers have covered a wide variety of recipes and variations, so consider trying a few to see which you like best! Pinch My Salt posted a recipe for stroganoff with whole wheat noodles. Your old favorite, with a healthy flair. Tammy's Recipes has a quick and easy version that your family will love. It's a hearty meal you can prepare in under half an hour. This stroganoff recipe comes from Katia's Russian Tea Room, straight from a Russian chef. 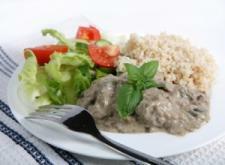 Why not make stroganoff ahead of time in your slow cooker? This post has lots of great photos to help you along with the preparation. 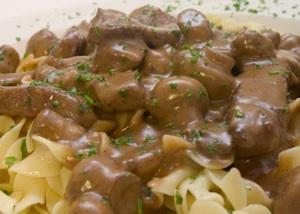 There's even an entire web page dedicated to beef stroganoff!